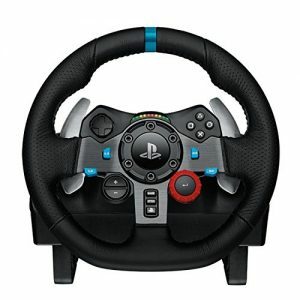 The Logitech G29 (or G920) is the racing wheel that I would recommend over any other at this time, unless you want to spend at least 4 times this amount on a Fanatec product. Until recently, I was still using an old Logitech G27 and I loved it, although I did upgrade the brake with a Ricmotech load cell. I upgraded to the Logitech G29 wheel. I still use my old pedals with the load cell modification and a Leo Bodnar Cable. The Logitech wheels are relatively inexpensive yet they are incredibly stable, precise, and durable. The Amazon listing says this is for the PlayStation 3 and PlayStation 4, but it’s also for the PC. Likewise, the listing says “Wheel Only” but this set includes the wheel and pedals. It does not include the H-pattern shifter which you can get separately. If you do want the shifter, you can save a couple of bucks and buy the wheel and shifter bundle here. More buttons on the wheel. The G29 and G920 are more stable and smoother than the G27. If you have a Logitech G27 racing wheel, I would say that it is worth the upgrade to the Logitich G29 or G920. One thing that I do like about the G27 is the placement of the buttons. They are easier to reach with your thumbs than the buttons on any other wheel I have seen including the newer Logitech products. If you would like to save a few bucks, you can still buy a used Logitech G27 Racing Wheel.